Today, I’m taking a moment to honor one of the very few idols I’ve cherished since childhood, David Bowie. Hearing about his loss came as such a shock, one that struck a deep personal chord for me. In this month of New Years, resolutions and goal-setting, his departure made me take a deeper look at life, death, and the role metaphysical philosophies such as Yoga plays in the larger scheme of things. Bowie’s was a name never associated publicly with Yoga, unlike, say, Sting, Madonna or Lady Gaga, but for me, his life and work were always something I drew great inspiration from. He took his audience on a journey through his exploration of his multi-faceted self, and his capacity of self-reinvention went beyond mere publicity stunts – something that I think differentiates him from the vast majority of the pop stars today. They were genuine products of his artistic soul-mining, which brought so many gems to the surface! Maybe because he was a fellow Capricorn, I related to his complexity and layered way of seeing the world. I especially related to his theme of alienation, and his slanted view of life, being an outsider, an alien, loving and appreciating the ways of a place like its natives never could. He challenged us to face the impermanence of Life and see that “time may change me, but you can’t trace time”, and so we’ve got to find a way to ride these ch-ch-ch-changes in an evolutionary way. He reminded us that we’re all part of “the best-selling show” of Life (on Mars or on Planet Earth), and that we have the power to write its script anew at any point in time, if we could just mature in our awareness (so we don’t “grow up a cow”, like Mickey Mouse!). And so, Ziggy did so much more than just play guitar! He gave us all a lot more wiggle room for the Self, with all its crazy, quirky, and often contradictory expressions. 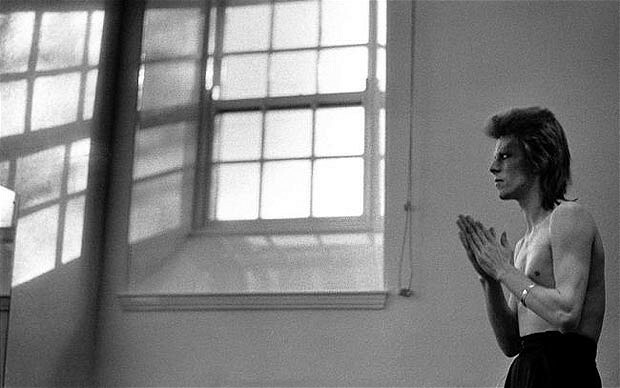 The next time you feel trapped by life, just remember these yogic lessons from Bowie! You have the capacity to reinvent yourself, you can write the script of your own life, and, however difficult the situation, as the cancer undoubtedly was for David Bowie, everything can be a fuel for your glorious original expression from your soul. P.S. ~ I would love to receive your feedback on this little article. Was it helpful? Appropriate? As you can see, I don’t see anything as exclusive from Yoga, because I see Yoga as a way of perceiving and living life. Hope this served you, and stay in touch!